McLaren, however, ran a continuous development program that enabled them to start with a winning combination and build on it from year to year. From the M6A of 1967 to the M20 of 1972 each year’s car was a logical and effective extension of what had gone before, incorporating all the lessons learned from previous seasons. This made McLaren the only team , until the arrival of Penske Racing and Porsche in 1972, that always showed up at the season opener with cars ready to race. This leads to an intriguing question. 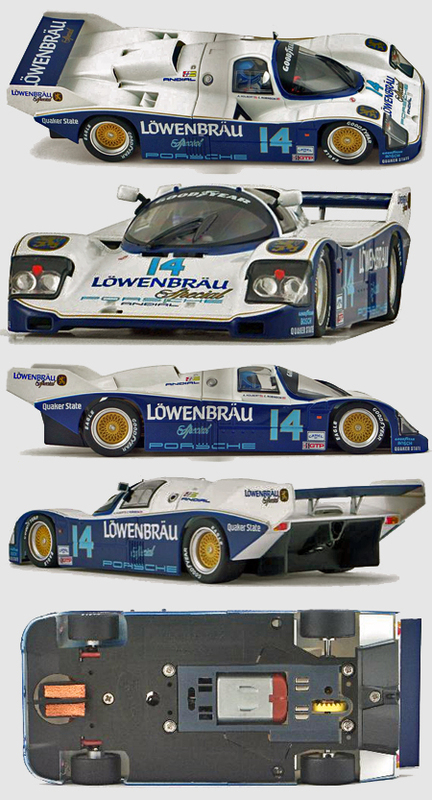 What would some of the other cars have achieved and what might they have looked like if they had evolved and been properly and professionally developed with an adequate budget over several seasons? One such car is the McKee Mk 10, more commonly known as the Cro-Sal Wedge. Like all of Bob McKee’s creations it was built and raced on a relative shoestring, but if any car other than a McLaren looked the part of the quintessential CanAm car the Wedge was it. As it happened, the one-off car, which was really just a rebody of an earlier McKee, passed through the hands of several owners, none of whom had enough resources to make it a success. Not that they didn’t try. The car went through several attempts to make it a winner, even including one in which it was fitted with, of all things, a dragster-type blower. We actually saw this permutation of the car in action at Riverside in 1971. The thing had truly awesome acceleration. We saw it blow by Denny Hulme’s McLaren on Riverside’s long back straight as if Denny had an anchor out. Unfortunately, the dragster engine was either all the way on or all the way off, which made the car a moving roadblock in the corners. Hulme repassed the McKee in the next corner and just drove away from it. And so it went until eventually the Wedge passed into the hands of vintage racers who restored it to something close to its original configuration and its Cro-Sal livery. It’s now a distinctive and popular car in vintage racing. But what if McKee’s concept for this car had emerged from a team that had had the resources to keep developing it from year to year as McLaren had done with its design? What might it have looked like after a few years? Well, as it happens, we had lying around several examples of Strombecker’s late 60s Cro-Sal Wedge body, as sold then in the form of an RTR car. These bodies and cars turn up frequently on eBay at very reasonable prices, by the way. We decided to kitbash one into our idea of what the ultimate McKee Wedge might have looked like, using current-production components for the chassis and running gear. Well, actually we used two of them because the fist thing we had to do was to make the body half an inch wider to fit the chassis, wheels, ans tires we wanted to use and to transform the Strombecker body’s somewhat toylike proportions to something more nearly accurate. The easiest way to do this was to cut up two bodies as shown below. Here’s the result, with the original car for comparison. You can also see in this photo that we cut out the cockpit opening and began to make some changes in the engine area. The joints between the glued-together sections of the body needed to be reinforced for adequate strength. We used .020″ sheet styrene. 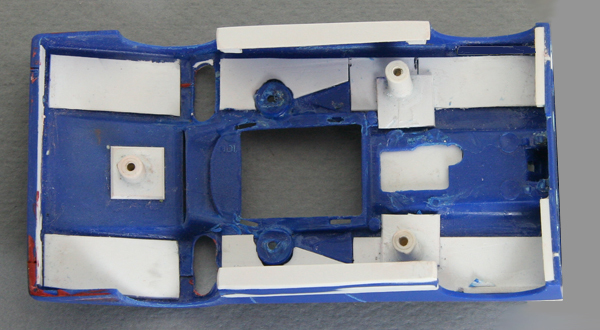 This shot also shows where the original body posts were removed and new ones installed to match the chassis we are going to use.The body now is 2.5″ wide, about the maximum practical width for racing on most 1/32 scale track systems. You can also see where we cut out the vents on the rearward face of the front fenders. 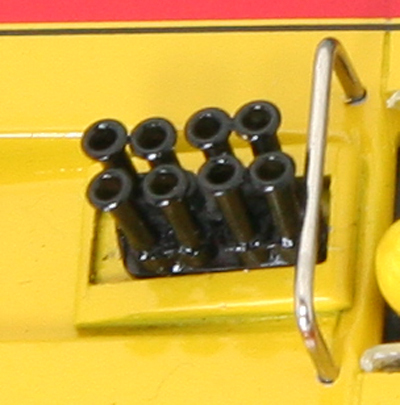 Many race cars have air outlets of some kind in this general area to release lift-creating high-pressure air that builds up in the wheel wells. All of the fabrication was done with medium-thickness CA glue. The next step in modifying the body was to add a wing. by 1970 wings had become more or less universal on CanAm cars and our developed Wedge would have needed one. The problem with putting wings on slot cars is that they tend to be rather delicate and prone to crash damage, or at least their mounts do. When we do project cars it’s always with the idea that at some point they may be put onto the track and raced in earnest. Therefore, the wing installation had to be as strong as possible. There are basically two ways to mount a wing. You can either put it atop a vertical mount (or two of them) extending upward from the back of the body or you can put it between two fins. The problem with both of those is that you can’t get a very solid attachment between the wing and its supporting structure because there simply isn’t enough surface area where the wing joins its mounting structure to allow a really strong glue joint, at least not without some seriously non-scale reinforcing. You can either have a strong wing or a scale-looking wing but not both. We have found the best compromise between looks and strength to be a GT car wing with good-sized endplates mounted between fins. The surface area of the endplates offers lots of gluing area between the wing and the fins for a solid wing mounting. On our Wedge, we used a GT car wing from our junk box. It was 2.25″ long including the thickness of the endplates. We used a Moto-tool with a carbide disc to cut two slots in the upper surface of the rear of the body spaced accordingly. We tack-glued two thicknesses of .030″ styrene together and cut out two fins to fir in the slots and extend 9/16″ back from the trailing edge of the body. Of course, we could have made them any size we needed to get the desired wing location.. We CA glued the two fins into the body and then glued the wing between them, being careful to spread CA glue onto the entire area of the wing endplates and set the wing straight, level and at the desired height and angle. If we had wanted to we could then have added some extra sheet styrene to the inner faces of the fins to blend in the endplates, though we didn’t do that. A number of CanAm, Group C, and GTP cars have a wing mounted between fins, and you can use this procedure to give any of them a much stronger wing installation. It’s simply a matter of finding a wing the right length to fit between the fins on your particular car. This is one reason why you should always save the broken-off wings from your wrecked cars, along with any other parts that may be useful in the future. This photo shows the assembled body with the wing in place and body filler applied and sanded. From here it’s just a matter of fine finishing to get all the body surfaces smooth and then on to painting and detailing. The base is cut from .040″ styrene. A piece of .020″ thick strip down the middle separates the two banks of injectors. 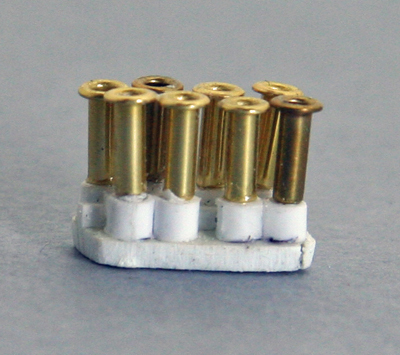 The lower part of each injector is a 5/32″ length of Plastruct 90604 1/8″ styrene tubing. You can make this part whatever length you want to get the desired overall height for your injector stacks. After gluing these in place, with the two sides slightly staggered as on a V8 engine, we drilled a 1/16″ hole through the base at the center of each. Into each hole we CA glued a 9/16″ length of Plastruct 90102 plastic coated wire, tapered down to the diameter of the wire at the upper end. We then pressed a Parma #622 brass ferrule down onto each piece of wire, adjusted the angle of each ferrule, and then put a drop of CA glue down each one. The result is an injector assembly that has 26 parts in it but is far stronger and more crashworthy than any similar part molded in solid plastic.. Our car will not have injector stacks breaking off it. Here’s a closeup shot of the finished and painted assembly mounted on the car. To keep this project as simple as possible we painted the entire body in one solid color and did all the rest of the livery with decals. The color we used is Testor 52713 Boyd’s Dark Yellow. However, we wouldn’t recommend using this shade now that we’ve seen it on a completed car. The problem with it is that under bright incandescent light it is a beautiful, rich shade of yellow, but under fluorescent light or at lower light levels it looks somewhat muddy. 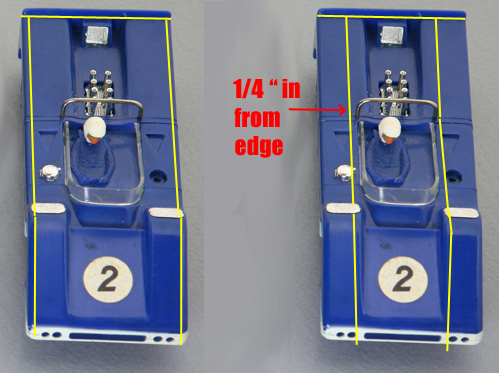 It would be fine on a 1/1 scale race car, which always runs outdoors in daylight (and nobody cares what it looks like the rest of the time), but slot car tracks often are located in rooms with fluorescent and/or inadequate lighting, and there this color doesn’t look as good. 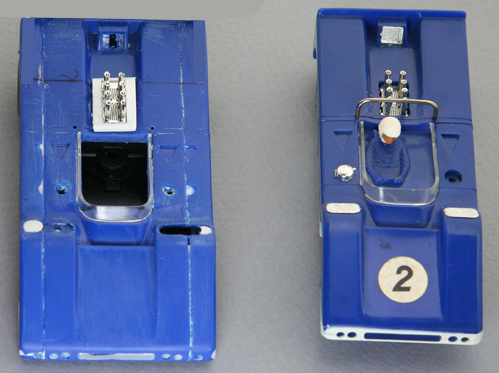 The stripe decals are from an eBay copy of the decal sheet from a Matchbox Porsche 917-10K as are the numbers and the Die Hard decals. The Navy decals are from an eBay Brumos Porsche decal sheet. The MAC tools decals are also from eBay. The ASR class designation is something we printed up on our computer using an HP Photosmart printer. The openings in the front fenders and the rear of the body are filled in with fine-mesh brass screen. Screen of this type is available in many model train shops and at good-quality hardware stores, where it will be less expensive. The exhausts are Plastruct tubing and the taillights are salvaged from a Scalextric L88 Corvette. 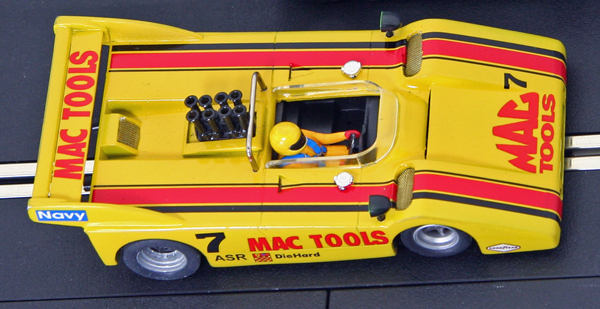 The interior tub and driver figure came from a junk LeMans prototype body. The tub received a bit of reshaping along its upper edges to match the contours of the Wedge body. The mirrors are two mirrors that had broken off a car. We saved them for a project such as this. We drilled a 1/16″ hole in the bottom of each and CA glued in a stalk made of Plastruct coated wire we used in the injector assembly. We now have much more crashworthy mirrors. The only remaining unmodified parts of the original Strombecker body are the windshield, the roll bar (metal, by the way) and the two gas caps. Of course, no one knows what might have been done with Bob McKee’s most famous design if the budget and resources had been there to keep developing the concept aggressively, but we think it’s not unlikely that the result might have looked much like this. in any case, it’s fun to combine creativity with history to imagine in miniature what might have resulted. If you have any comments or questions about this article please send them to support@electricdreams.com. NEXT — Chassis and running gear. You can build it with inexpensive components readily available from Electric Dreams.